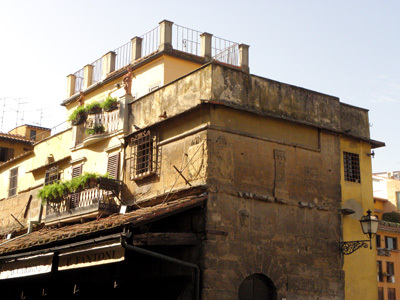 Coming out on the other side of the Ponte Vecchio is the Pitti Palace. At first glance it seemed a little dismal but the interior more than made up for it. Alas, again photos are not permitted. This picture is a little misleading as to the gentle incline leading up to the entrance. 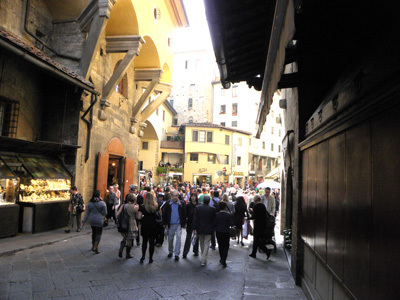 Yes, it’s just a tad steeper but by this time we had left the City Centre, visited the Piazza, wandered through the Ponte Vecchio and my feet were toast. And yet another beautiful building to explore. I figured I could have comfortable feet at home so I was going for it! Yep, we’re a couple of rebels! (Hubby’s feet were unhappy as well). So upward and onward and into the Palace. 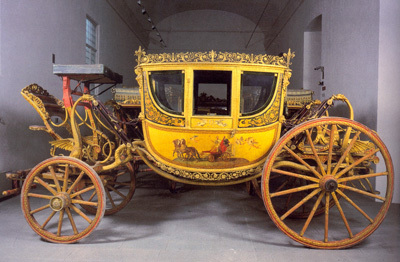 This next picture is scanned out of “The Official Guide of the Pitti Palace”. 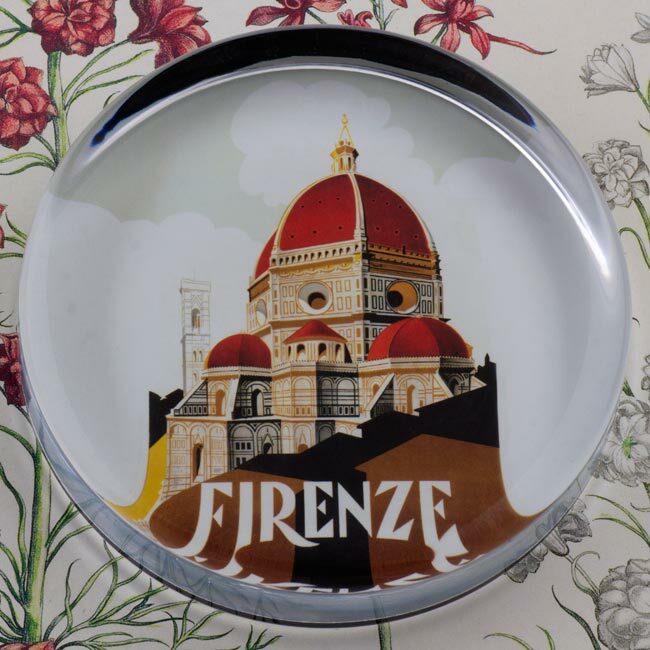 We bought them at the Uffizi Museo, and the Accademia. It will make you lick your lips…..mmmmmmm. I could scan forever out of this book (now that I have access to one) but I’m not going to spoil you – it really needs to be seen up close and personal. 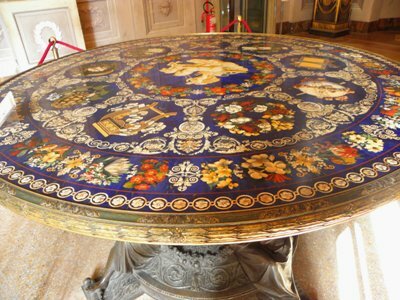 The next picture is of a table top. I wonder how long it took to complete? 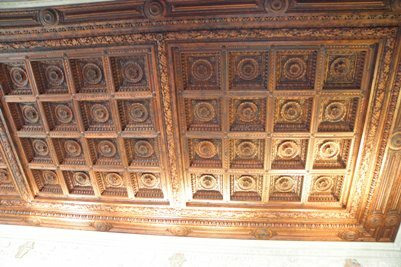 The workmanship is amazing. Unfortunately there wasn’t a description of it in the guide book. Another thing that disappointed me in the guide book was the lack of pictures and information on the “Costume Gallery”. Yes, ladies, they had clothing from the 18th and early 19th centuries. Even some as late as the 1970’s but the 1950′ and 1960’s were so Jackie O. Scrumptious! And the shoes! 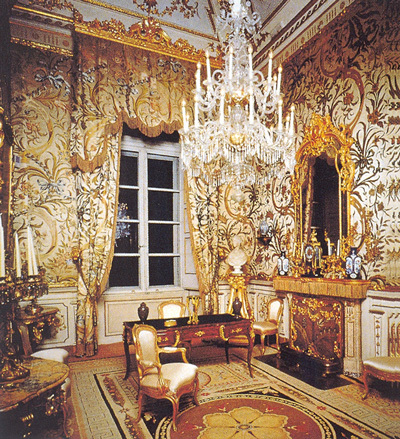 Very ornate and some looked more comfortable and the styles we wear today! Now since you gentlemen have been so patient with me writing about clothes, shoes, jewelry, etc. I am going to break my rule (isn’t that what they’re for?) and scan in a few shots for you car fanatics. Hey what do you think NASCAR would think of these beauties? Pretty wild, huh? 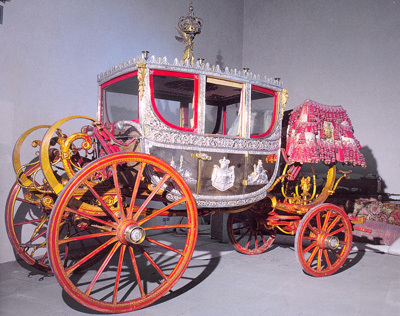 I’m sure the next one is a ladies carriage, and it came with an interior shot! Any woman who has read a regency novel would love to see the inside. I know I was pretty intrigued. Good grief. And I’m pretty sure they didn’t have sunglasses! But wait, there’s more…. No leather heated seats, but not too bad. 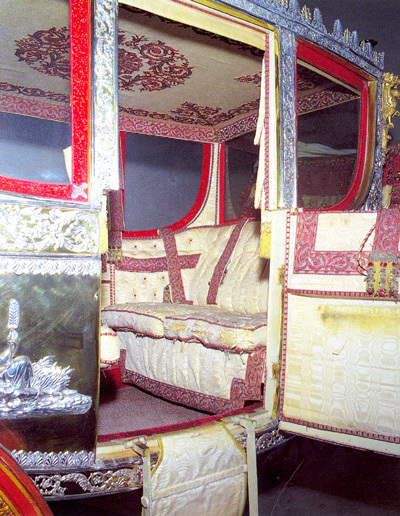 Of course these carriages are for Royalty. 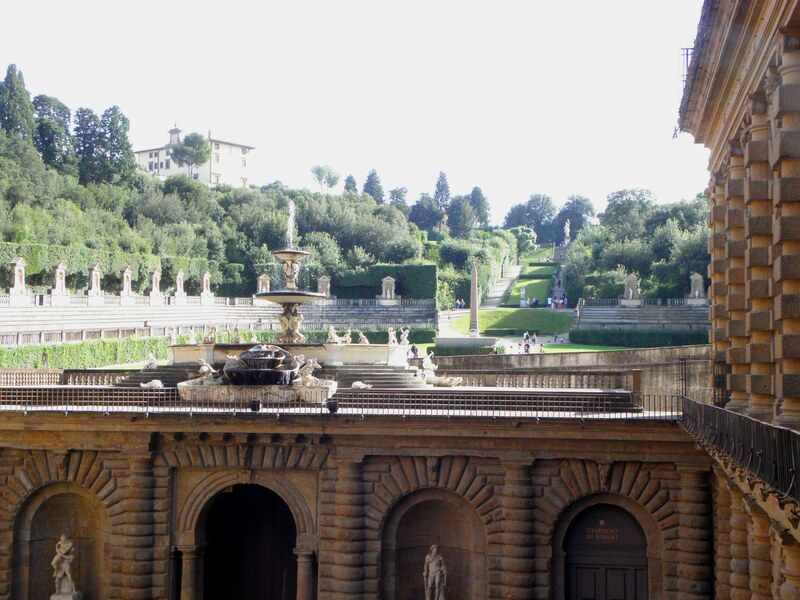 The above picture was from inside looking out toward the Boboli Gardens. Look at that huge courtyard! Below is outside at the gardens – similar shot but a little clearer I think. I know I told you I could have happy feet at home, but after all this in one day it broke our hearts not to be able to hike up to the Boboli Gardens. But I have a sneaking suspicion we just may be back for more! 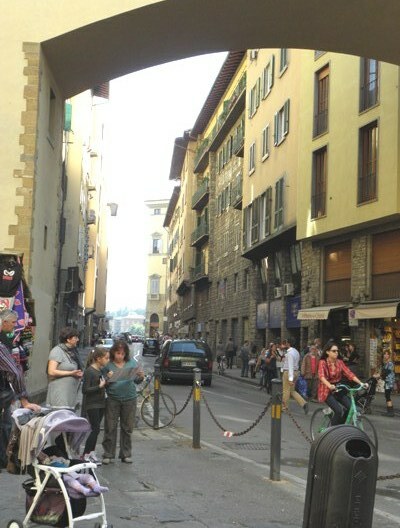 Ah yes, about to explore the delights of Ponte Vecchio. How could I forget? 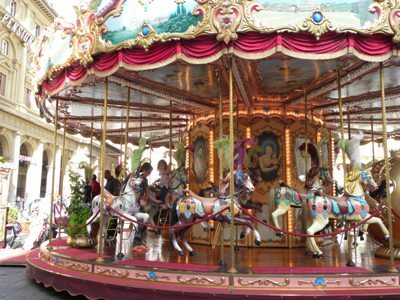 After the delightful Piazza, how could we be prepared for the infusion of energy, light, humanity, and ouch! The glare of the sun staring us in the eyes! Ah well, such are the sacrifices we must endure and thank heavens for sun glasses! We needed those for the displays of the shops. 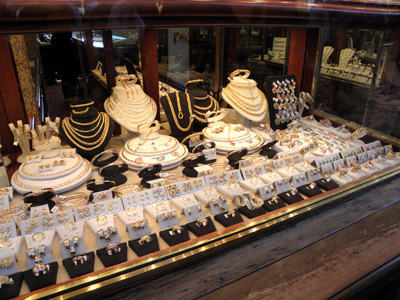 I have never seen so much sparkly jewelry in one stretch of real estate before. It was gorgeous. I found a particularly fetching ruby and diamond set of earrings with matching pendant, however hubby and our bank accounts screamed out in protest like a well practiced duet so I gave up with good humor. The look on his face was worth the price of even mentioning it. He can be so easy sometimes. But to be fair, I can relate Euros to Monopoly money. The above pictures is just one of many store shops displaying fantastic pieces. If you think it’s a little out of focus, it’s probably for your own good. Oddly enough it was the only picture of jewelry I could get. Go figure! 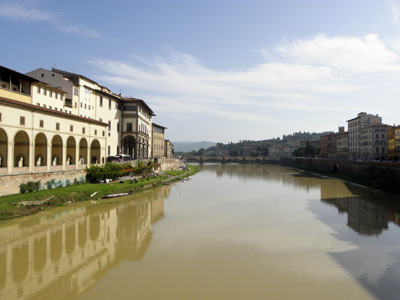 We continue wandering across the Ponte Vecchio and here are some shots just for flavor. 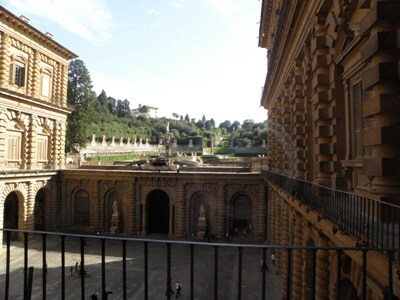 Before I get too far ahead of myself, this is at the beginning looking back at the Uffizi Museo. 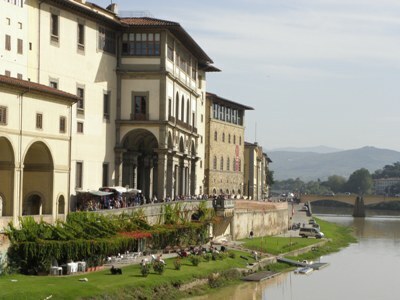 And this shot is also looking from the Ponte Vecchio and I just thought it looked like a dreamy shot from years gone by. Now back on track..looking at these pictures again, after seeing them close up and personal, don’t you think that even though, or maybe because they are so old, they look so cheerful? They still give me that “dewy afterglow”! Is that too personal? Ah, now to the nitty gritty! Serious shoppers! 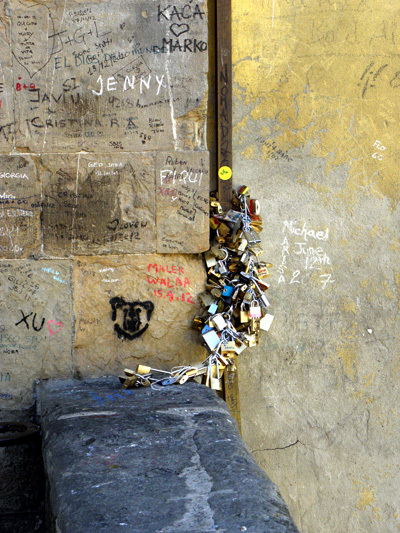 Today, there is a hefty penalty to all who are caught locking or attaching anything to the Ponte Vecchio. These days, lovers simply come to the famous bridge and simply touch the remaining padlocks that have not been removed. Luck has kept them there, locked to the bridge, perhaps some luck will rub off on the hopeful couple as well, and keep their love alive for eternity. We had been told about the locks and had planned on doing it, but with time constraints, etc. we never quite got around to it. Good thing! Very bad manners and a hefty fine. And I don’t think that would be Monopoly money! 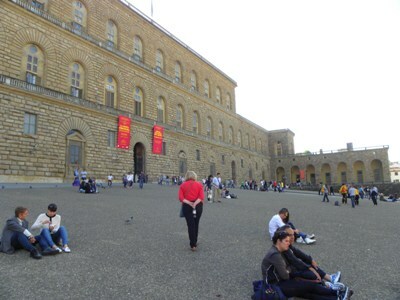 More tomorrow – Pitti Palace time! Sunday we decided to play gladiators and see if we could get killed. By ourselves. Let’s do three times the activity in one day so far and see what happens. That would be me finally catching hubby creepy germs of the “Perils of Paul(ine)” fame. And I didn’t even buy anything except art work for our cat. (You didn’t think she’d be omitted from this blog now did you?) Yes, we have a “Princepessa” in residence at home. Anyway, I will be doing the three above “P’s in a series, between last minute dashing around and naps. 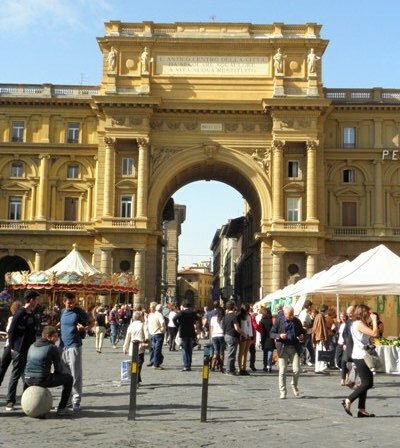 The Piazza Della Republic: we came through here going to and coming back from the Ponte Vecchio and Pitti Palace. I can’t resist the carousel off to the right in the previous picture. It gorgeous and I wonder how old it is. 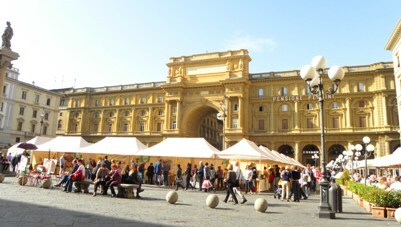 Next we have the farmer’s market, on the right had side are outside cafes where you can sip cappuccino and biscotti’s. This is just the tip of the iceberg for shopping the street vendors. Purses, scarves, I think I’ve mentioned them before. But did I say ‘FABULOUS!” Okay, maybe I did but I’m raring to go as this is our last day. And of course I have to say Arrivederci to Stefano! (Wink! wink!). 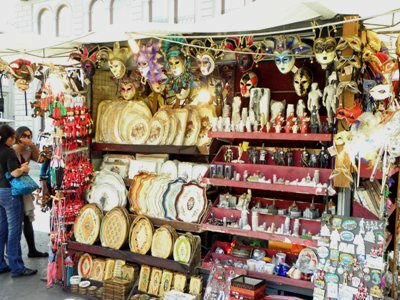 So when you come to Italy, it is always nice to bring presents to show appreciation and honoring their country. Well, being from the Southwest of the USA, we decided to bring (in addition to the Sedona Sandstone and postcards, etc. a Javelina, native of our home state? Okay, just kidding. He was already there! 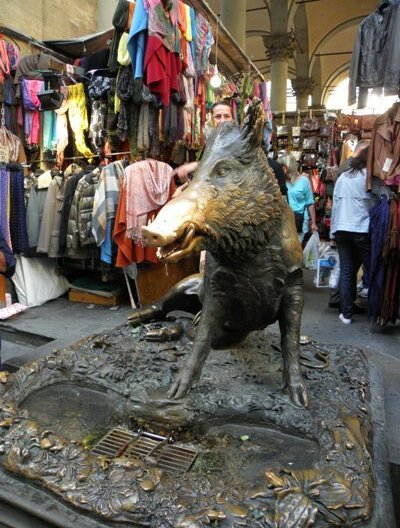 He has water coming out of his mouth (as you can see by that ever so attractive spittle hanging down) and you put a coin in his mouth and let go, and if it falls in the grate, the coin is supposed to bring good luck and then you pet him on the head to seal the deal. I may have the details of the story mixed up and I’m pretty sure he has a name – I’ll have to look it up. My coin went right in, poor hubby took three tries. It appeared to be that way with most men. I guess we women has less trouble throwing money down the drain! Lol! (Did I say that? Shame on me!) Anyway, boy can he command a crowd – and sometime an unruly one at that. I’m talking locals, too! 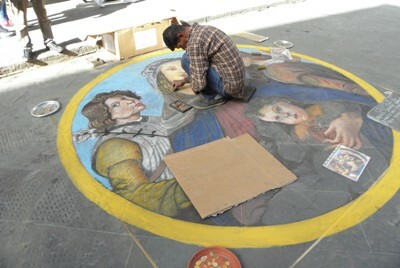 And of course we had to run into local street artists – there were two young men working on this piece. Very intently I might add! 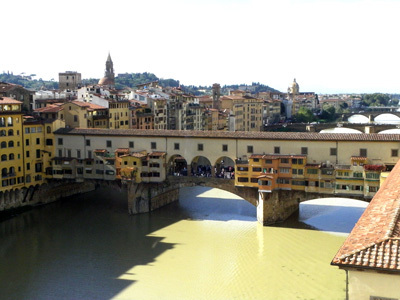 Next I will try to get to Ponte Vecchio soon – an adventure all on it’s own!!! !